Published 7/21/14. Updated with new photos and hints on 5/8/18. 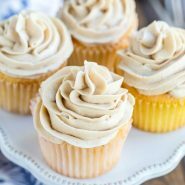 Whipped Brown Sugar Buttercream Frosting recipe is a light brown sugar whipped frosting that’s made without powdered sugar! I love the whipped buttercream frostings because they are so light and creamy without being heavy or greasy. They’re also pretty fantastic because you make the frosting without powdered sugar, so they’re perfect for those times when you don’t have any on-hand. 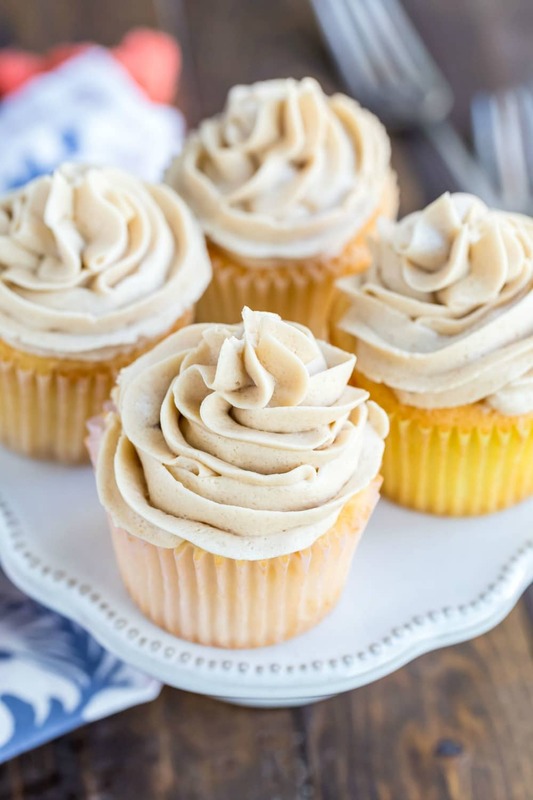 I’ve been thinking about making a brown sugar version for a while because some cakes pair so well with the caramel-y tones in brown sugar, and I have a cake recipe to go with this frosting that I’ll be posting on Thursday. Anyway, this whipped brown sugar buttercream frosting doesn’t disappoint. It is incredibly light and super creamy. It isn’t overpoweringly sweet either, so it pairs well with sweeter cakes. It’s especially good with fall-flavored cakes (i.e. pumpkin, apple, spice). If you’ve never tried a whipped buttercream, I think you’ll be pleasantly surprised at just how good they are. This recipe makes enough to generously frost 24 cupcakes or a 9-inch 2 layer cake. There are a few places where things could go wrong in this recipe. First, not cooking the milk mixture long enough. The mixture should be a thick paste. If it’s too wet, the frosting will be too loose. Second, the cooked milk mixture needs to cool completely. If it’s too warm, it will melt the butter, and you’ll end up with loose frosting that doesn’t come together. Third, using butter that’s too warm. The butter should be at cool room temperature. It should dent if pushed, but it shouldn’t be too warm and certainly not beginning to melt. Fourth, using old brown sugar. Brown sugar that is hard and lumpy won’t mix well with the butter. It’s best to use soft, fresh brown sugar. Fifth, not whipped the frosting long enough. The frosting needs to be whipped to get the right light and airy texture. Cutting the time short could leave you with a grainy frosting or a frosting that separates. More whipped buttercream frosting recipes! 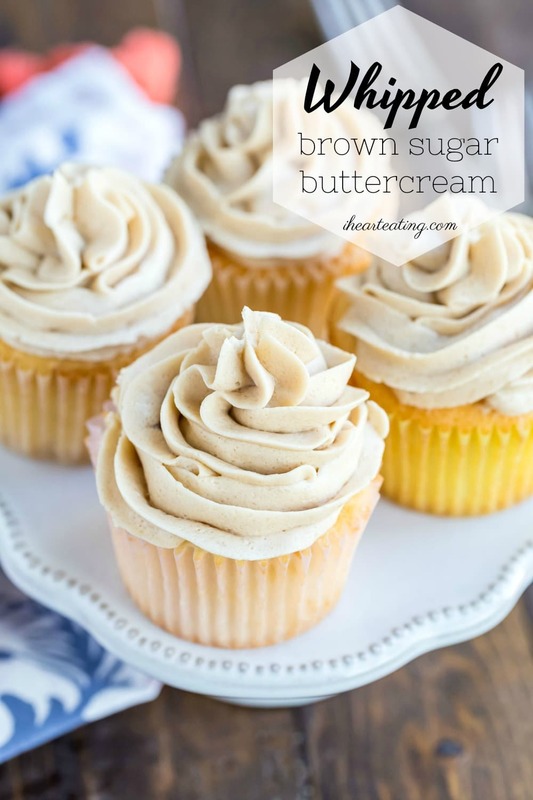 If you’ve tried this whipped brown sugar buttercream frosting recipe, don’t forget to rate the recipe and leave me a comment below. I love to hear from people who’ve made my recipes! You can SUBSCRIBE to receive my latest recipe newsletters or FOLLOW ME on FACEBOOK, INSTAGRAM and PINTEREST for even more delicious food. 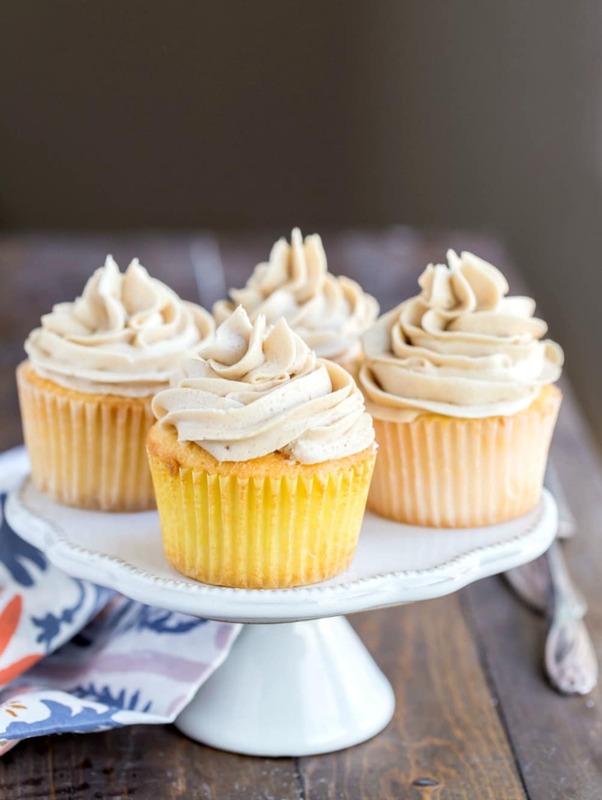 Whipped Brown Sugar Buttercream Frosting recipe is a light brown sugar whipped frosting that's made without powdered sugar! In a small saucepan, whisk flour into milk and heat, stirring constantly, until it thickens. It will be the consistency of a thick pancake batter. While the mixture is cooling, cream the butter, sugar, and salt together until light and fluffy on medium high, about 3 minutes. Beat it for about 5 minutes on medium-high to high until it looks like whipped cream. If you can still taste the sugar granules, keep beating it until you can’t. *So, what is "cool room temperature"? A lot of people think that room temperature butter means that the butter is on the verge of melted or is partially melted. That's too warm. Cool room temperature butter means that if you press it with your finger, your finger will leave an indentation in the butter, but the butter should still hold its shape and should still feel cool to the touch. **Check out the tips and tricks section above the recipe for more helpful hints. ***Nutrition facts have been estimated. Is it ok to prepare this frosting and frost the cake the day before serving it? Love this frosting! I’ve made this type of recipe with regular granulated sugar, but when I came across this recipe with the brown sugar I was so excited! It is amazing and those caramel-y notes are on point. I’ve used it to frost pumpkin cakes so far, it’s better than the traditional cream cheese for that, thanks for the great idea! Thank you so much! =) I’m so glad that you like the frosting. And thank you for coming back to comment! 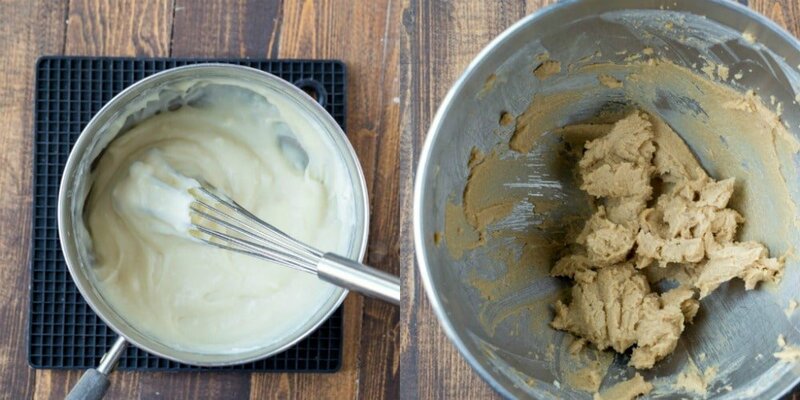 This is one of my go-to frosting recipes. I love it! Thank you! I’m glad that you liked the frosting! =) Thank you for coming back to comment! First time making it So far so good!!! I made this for a banana cake. I followed the recipe EXCEPT for the milk and flour part. I added 1 cup bittersweet chocolate morsels. The frosting whipped up like mousse. It was AMAZING. Thank you!!! I’m so glad that you liked it! =) The chocolate bits sound like a tasty addition. =) Thank you for coming back to comment! The frosting tastes like pure butter when I made it. It’s probably just me though. Any suggestions? I’m on the final step of beating the frosting and it won’t thicken to look like whipped cream. Can you tell me what it looks like? It should whip up to be light and fluffy once you combine the thickened milk mixture and butter/sugar mixture. I’ve had this happen in the summer, just put it in the fridge for a little bit and then whip it up. I just made this frosting. I may have A. not quite let my milk/flour mixture thicken enough, maybe. And B. may not have let it quite cool enough. So as a result the frosting did seem to separate. But I beat the heck out of it and it seems to have come together. It is a little looser than I am used to, and so I am putting in the fridge and waiting until closer to serving, before piping on my apple spice cupcakes. However…that being said, the frosting itself is so light, so airy, so mildly delicious and such a nice alternative to American buttercream and cream cheese frosting. I am in love with this and will surely make it again:) Also, yours is the first recipe I came across when searching brown sugar buttercream. I cannot believe how many others use confectionary sugar which seems to defeat the purpose? Thanks! Thank you so much! I hope that chilling helps. If not, I’m happy to help you troubleshoot. 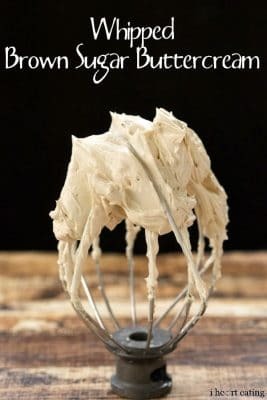 I love this frosting, and I make several versions of it, and I have a lot of experience troubleshooting frosting issues. =) Thanks for commenting! OH WOW! I can’t wait to try this. Frostings with powdered sugar just don’t have the flavor/texture I want anymore and anything with ‘brown sugar’ in the title has to be good, not to mention ‘buttercream’ to boot. SO glad I stumbled across this recipe. It has to be a 5 star, just from reading the ingredients. THANK YOU! I just made this recipe and it is amazing!!! It will pair perfectly with my chocolate chip cookie dough cupcakes! I found this recipe in a panic when I was making a cake at 9pm for a birthday the next day and realized I was out of powdered sugar. While I did not have regular cow’s milk, I used coconut milk in it’s place. The roux still came out very well with the coconut milk and the frosting was very fluffy (very much like a thicker whipped cream). I highly recommend this recipe and I loved the flavor of the brown sugar! I’m so glad that it came out well for you! Thanks for your note about using coconut milk. I could see that adding some extra creaminess to the frosting. =) Thanks for taking the time to comment! This was so delicious! We can’t do dairy at the moment, so I subbed unsweetened vanilla almond milk, and earth balance vegan “butter” sticks. I also only had cake flour left because I used up all my all purpose right before. Turned out great. Could you substitute water for the milk? I don’t think that it would give you the same results. Is there a reason why you wouldn’t want to use milk? I might be able to help you figure something out if you give me more info. Hi! I’m sorry to hear that you’re having trouble! It sounds like the flour wasn’t fully incorporated in the milk. That could cause both the lumps and the milk mixture not thickening enough. You could try straining it and then chilling it. It firms up quite a bit once it has been chilled. I hope that helps! I am going to make a 9 x 13 “Texas sheet cake” and want to frost it with the Whipped Brown Sugar Buttercream Frosting. You don’t say how much frosting this recipe will yield in terms of cake layer sizes and quantity. If I have leftover frosting, will it freeze well? One batch of frosting should frost a 2 layer 9-inch round cake, 9×13 sheet cake, or 24 cupcakes. I haven’t tried to freeze the frosting. It does keep well, covered, in the fridge. My icing will not thicken. Any suggestions on how to fix this issue? What step are you having trouble with? It looked yummy at first the butter was not mixing. So I put it in the blender and with a little dash of milk best frosting ever. Love this! I cut butter back to 1 cup (out of necessity) and it still came out GREAT! Put it on Butter Pecan loaf cake! Amazing combination! I tend to really be aweful at making frosting but this turned out perfectly! !!!! Light fluffy whipped perfection! I used unsweetened almond milk because it was what i had in the fridge i also added a little cinnamon, nutmeg and ginger to the flour mixture because I made a sweet potato cake. Im in shock about how amazing this turned out! I highly recommend this not gritty at all! Thank you so much! Also, thanks for your notes about your changes! I get lots of questions about using different types of milk, and it’s helpful to hear from people who have tried it.